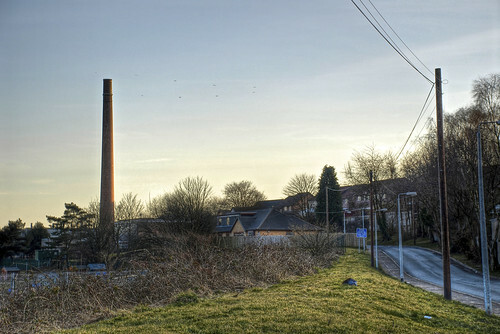 Posted by Stuart Herbert on March 18th, 2010 in A473, Church Village, Medical, Merthyr Road, Modern, Photos, Shoot. Driving home from doing the shopping this afternoon, Kristi spotted this chimney out of the corner of her eye. Naturally, we just had to go and investigate, and with the last light of the day, we managed to snag this photo of what was once the East Glamorgan Hospital. Built during World War II, the hospital was finally closed in 1999 after the opening of the new Royal Glamorgan Hospital over to the north-west of Llantrisant. Sadly, the handover did not go as smoothly as one would like, with human tissue samples reportedly discovered by the workmen who came to clear the site, and with patients of the mental health unit left with nowhere to move to. Today, most of the site has been cleared for a large housing estate, but the iconic chimney still remains. Searching online, it isn’t clear what the site is used for today; the road shown in the picture has a sign insisting that the place is private and off-limits (which we respected), bearing the title of the Pontypridd and Rhondda NHS Trust. Their website is still online, but the trust itself has been replaced not once but twice … a damning inditement of the inefficiency in government-run organisations over the lifetime of the current government. If you’re able to shed some light onto what this site is used for today, please leave a comment below.